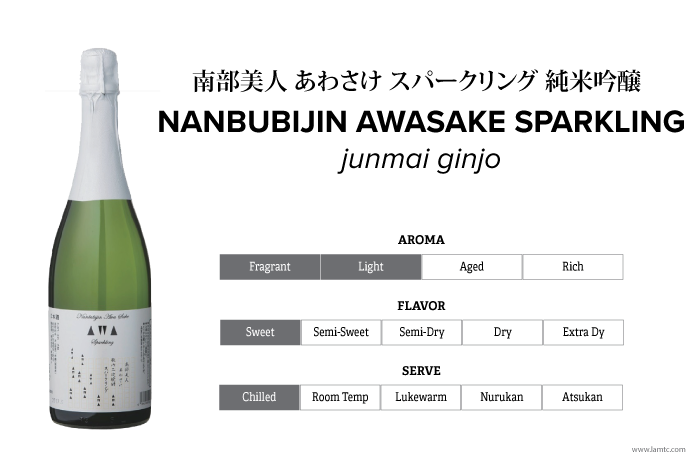 With a pleasant, Ginjo aroma, and gentle yet refreshing mouth-feel, this well-balanced sparkling sake finishes with the clear presence of umami from the rice. This "innovative sake" from Nanbu Bijin aims higher than ever, by incorporating the newest theories and thinking, while protecting those things which should never change. **Be sure to serve well chilled. When opened at higher temperatures, contents may spray out.